They were courteous, friendly and did everything exactly as we asked them to do. There’s moving, and then there’s MOVING. All moves are challenging, even if you’re moving to another floor in your building or just a few blocks away. But moving to a neighboring state or across the country comes with many more challenges and considerations, both emotional and logistical. Cross-country moves involve more than just a change in zip code. Many areas of your life change, from your job to proximity to friends and family. Managing the plethora of responsibilities on your plate can be overwhelming, but don’t panic or throw in the towel just yet. All Jersey Moving & Storage has been helping professionals, retirees and families execute cross country moves for decades. Our experienced movers have learned a thing or two about how to minimize the stress and maximize the efficiency of your cross country move. Hire Experienced Professional Cross Country Movers. If you’re moving to another state or across the country, you have enough on your plate to worry about. You deserve to have peace of mind that your move is being executed by a moving company with expertise in executing long-distance moves. Moving companies that specialize in cross-country moving have the equipment, skill and experience necessary to ensure that your move is organized and executed on schedule. That means no missing boxes, damaged furniture or frustrating delays. Professionals and families turn to All Jersey Moving & Storage because of our expertise in executing cross-country moves. Based in New Jersey, we specialize in expedited service on long distance moves within a 500-mile radius up and down the East Coast, including all points between Maine and the Carolinas. For moves beyond a 500-mile radius, we work in partnership with National Van Lines executing moves anywhere in the continental U.S. Investing in professional movers with experience in long-distance moving will give you peace of mind that your valued items and furniture will reach their destination in the same condition they left your old home or apartment in. Do Your Research: How to Find Cross-Country Movers You Can Trust! No one wants to worry about the professionalism, competence or reliability of the movers they hire, but this is especially true if you’re moving to a new state or across the country. There may be many moving tasks on your plate, but finding a professional moving company with expertise in cross-country moving isn’t a task you can afford to rush. Do your due diligence! Ask friends and family for recommendations about movers they have personally enjoyed working with and make time to read online reviews. Get quotes from the top moving companies recommended to you and ask to speak with customers who they have recently helped with cross-country moves. All Jersey Moving & Storage has earned a reputation as one of New Jersey’s most trusted movers with experience executing both local and long-distance moves. We are one of only fifteen moving companies in the state of New Jersey that has received the "Circle of Excellence" designation by the New Jersey Warehousemens & Movers Association. We are also ProMover Certified and earned the esteemed Angie's List Super Service Award in 2012 and 2013! Secure Your Moving Date ASAP. Once you’ve found a professional cross-country moving company you are comfortable with, take decisive action and book them! Whether you are moving to California, Moving to Texas, or moving to Florida its best to plan ahead. The sooner that you secure your moving company, the greater the chances you will be able to move on your preferred moving date. Booking your movers in advance is especially important if your moving date isn’t flexible due to a new job start date or family circumstances. At All Jersey Moving & Storage, we recommend that you book your cross-country movers at least a month in advance. That being said, we understand that sometimes “life happens” and you don’t have the luxury of booking so far ahead of time. We always do our very best to accommodate last minute moving requests. Still, if you are interested in our moving services, we encourage you to book as far in advance especially if you are as possible so we are able to execute the move on the date that best meets your needs. Make Packing a Top Priority. Without a doubt, one of the greatest stresses of moving is packing. Many people underestimate the enormity of the task. Packing up all the belongings you’ve accumulated over the past few decades takes time. 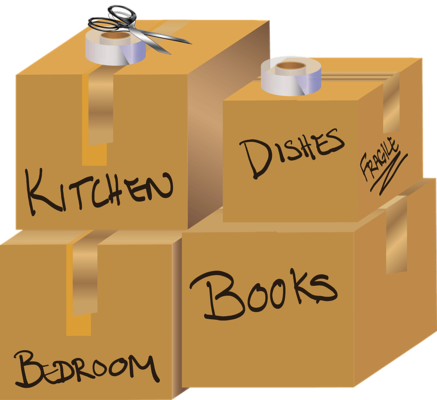 At All Jersey Moving & Storage we recommend that you begin the packing process a month or two before moving day. That way you can approach the task methodically rather than frantically! It will give you the ability to pack in increments, so you don’t exhaust yourself. Finally, you’ll be able to take the time to pack your items with care, ensuring they reach your long-distance destination unscathed. Packing up all your belongings is daunting and it can be hard to know where to start. Mapping out a clear plan of action will minimize the stress of the packing process and help make it more manageable. Identify which rooms you want to tackle first, second, third and so forth. Block out “packing times” into your schedule. Weeks before moving day, begin packing items that are infrequently used such as antiques, China, stemware, holiday décor and other items in storage. Save packing items you use on a regular basis until the week before moving day. Because of the cost of moving your furniture and belongings across the country, it’s important that you give yourself sufficient time to sort through your possessions and decide what you really want to keep as well as what you’re ready to part with. Create piles for items you want to keep, sell, donate, give away and put into storage. *Give yourself time to sell items on your terms. One of the reasons it’s important not to leave packing until the last minute is that selling items of value that you no longer want or need can be time-consuming, especially if you want to hold out for the right price! Whether you’re posting your items on platforms like Craigslist or Facebook Marketplace or running an old-fashioned yard sale, the longer you give yourself to hold out for a price that works for you, the better! You may also decide that you want to donate certain items like old clothing or furniture to a non-profit organization in your community that supports needy families. Give yourself time to make these arrangements, especially if you want to work with an organization that can pick up the items from your home. Inevitably, during the packing process you will come across items such as antiques, artwork, or furniture that you don’t want to sell, donate or throw away. They may hold sentimental value or simply have too much value to let go of. Placing these items in a secure storage facility will ensure you don’t have to worry about finding space for them in your new home. If you decide to place the items in storage in New Jersey, you also won’t have to pay to move the items out of state or across the country to your new home, reducing the cost of your move. There are two main storage options available to you: self-storage or containerized storage. Containerized storage has many benefits worth considering. Unlike at a self-storage facility, furniture and boxes aren't simply stacked on top of one another. Most self-storage units have 8-10' ceilings, so items which are no longer blanket-wrapped are piled high to maximize space. This puts your valuables at serious risk of being damaged. At All Jersey Moving & Storage’s containerized storage facility, your items are stored in large sealed and secured wooden containers so that nothing can be scraped, crushed or dented. We also have racks where sofas and loveseats can remain on their feet during storage. When these items are stacked in self-storage facilities, they are often left with permanent indentations or even tears in the upholstery. Make Time for Miscellaneous Moving Logistics. One of the key differences between short distance moves and out of state or cross-country moves is that the latter involve a lot more change. Setting yourself up for a smooth transition to your home in a new state therefore involves a lot of planning. Making time to tackle some of the following tasks will make it much easier to hit the ground running when you reach your new home. Records – Don’t forget to get copies of school, dental and medical records. Try to request them well ahead of the move as they may take time to compile. Prescriptions – If you’re currently taking prescription medication, make sure to get a copy of your prescription to bring to your new drugstore. Secure your pets – Ensure that you order your pet new identification tags that reflect your new address. You may also want ask your new vet to implant a microchip in the event that your pet gets lost in their new, unfamiliar territory. Jewelry and other valuable – Remember to empty your bank deposit box of all jewelry, important documents and other valuables. Invest in a secure safe and keep it with you on moving day. All Jersey Moving & Storage can handle larger valuable pieces like artwork or antiques. Library books – Return any library books that have been sitting on your bedside table or that surface during the packing process. Change of address forms – Many institutions require that you update them on your address. Try to fill out change of address forms at least a month prior to your move. You can do so online at usps.gov or at your local post office. Remember to notify your bank; insurance companies; credit card, phone and internet providers; and utility companies about your move. Don’t do it too early as you don’t want private correspondence arriving at your new home while the owners are still there. It’s also a good idea to ask a friend or neighbor to look out for mail after you’ve left. Founded by a family that has been in the moving business since 1956, All Jersey Moving & Storage is committed to handling your long distance cross country move with the same attention, care, and expertise that our local moving customers have come to expect. Our clients appreciate the peace of mind that comes with investing in a company that has been assisting professionals and families with similar long distance moves for decades. Based in New Jersey, we specialize in expedited service on long distance moves within a 500-mile radius, up and down the East Coast, including all points between Maine and the Carolina's. For moves beyond a 500-mile radius, we work in partnership with National Van Lines executing moves anywhere in the continental U.S. Contact All Jersey Moving & Storage today for your complimentary cross-country moving estimate.